Goldfinger is described as having a rationalist and industrial conception of the world. With a passion for expression of structure, these projects are no exception. 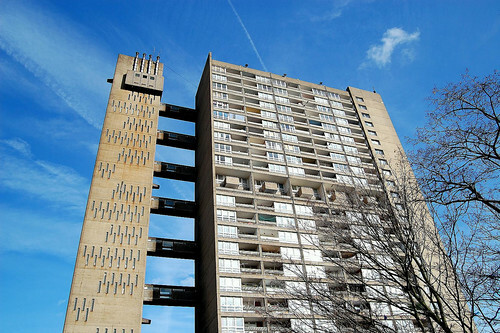 The Balfron Tower was the prototype for the larger Trellick Tower built in 1972. The Lift tower to each forms a distinctive element, separated from the main block for acoustic reasons, and linked with bridges at every third level. The boiler house is located at the top of the lift tower. This combined with the stark concrete and slit windows gives a fortress like aesthetic. The Trellick tower has the same footprint as its predecessor but was subject to proportional changes and also included an additional 4 storeys. Refinements in technology include the sophisticated electrical installations and double glazing throughout as standard. The interiors are claimed to be spacious in comparison to other social housing projects, and above the Parker Morris standard widely implemented elsewhere. There are two, four and six person flats or maisonettes. Most of which extend the full depth of the block. The wide structural bays make the units seem spacious, open and light and offers good outlooks.